If you haven’t noticed, we’re pretty big fans of the Hadid sisters around here. Not only are they strikingly beautiful, but they also star in some of the coolest fashion campaigns and seem genuinely kind and hilarious on social media. What more could you want from a set of It girls? Well, another sister who’s just as cool, perhaps. Enter Alana Hadid, the older half-sister of Bella and Gigi. Their father, Mohamed, had Alana before his eight-year marriage to Bella and Gigi’s mother, Yolanda Foster of Real Housewives fame. Alana may keep a lower profile than the other Hadids, but she’s involved in fashion just the same. The personal shopper and stylist has designed her own T-shirt line and once fronted a Topshop campaign. While she’s got Hadid poses on her Instagram account, she also likes to post artful selfies and has mastered funny captions. Consider her our latest obsession. Scroll down to see our favourite snaps from Alana’s Instagram account and the nine reasons she’s just as stylish as her sisters. #1: She does casual-dressy vibes better than anyone. This combo consisting of a sweater, skirt, platforms and socks is our favourite look right now. #2: White boots look ace on her. White boots can be a tough sell, but Alana proves this is the chicest footwear around. #3: Graphic tees are a key part of her wardrobe. Just like everyone else in the fashion industry right now, Alana can’t get enough of graphic tees. #4: Her Insta posing is exceptional. What’s a good Insta if the pose is off? Alana’s definitely got posing nailed (in true Hadid fashion, of course). #5: Jeans are important, but they have to be super cool. For Alana, jeans can’t be ordinary—they have to be reconstructed with raw-edge hems. #6: When it comes to jewellery, she's a magpie. We also find ourselves drawn to the shinier things in life. Can she just be our friend already? #7: The slip dress continues its reign, thanks to Alana. There are so many things we could say about this outfit and how much we love it. But let’s just say that it’s breathed new life into how we’ll be wearing our slip dress this season. #8: Alana loves athleisure just as much as Bella and Gigi. 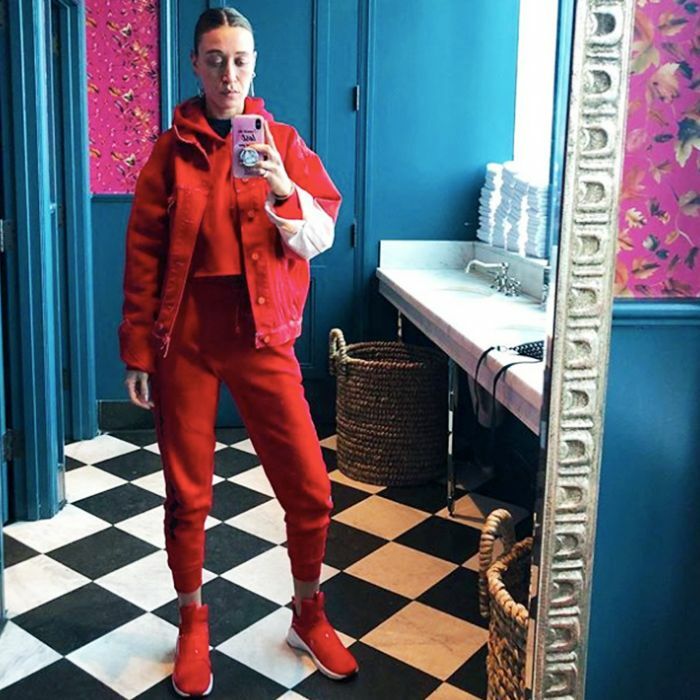 She wouldn’t be a Hadid sister if she didn’t know how to do athleisure. #9: She does accessories with real panache. Jewellery over a scarf? Yes, please. Want more from the Hadid sisters? Here’s why Bella Hadid’s style deserves our attention.